What is the PERFOROMIST® (formoterol fumarate) Inhalation Solution Savings Card? The PERFOROMIST® Savings Card can reduce your out-of-pocket expense to as low as $0 after you save up to $350 for 90 days of therapy or $50 on 30 days of therapy. No other purchase is necessary. Valid prescription with Prescriber ID# required. Restrictions apply. Please see full terms and conditions. Please select one of the below options to proceed. 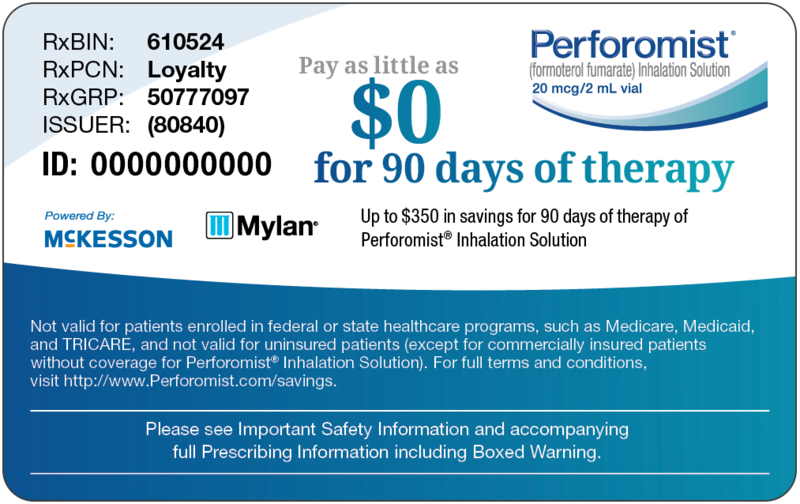 This SAVINGS card can be used to reduce your out-of-pocket expense for Perforomist® Inhalation Solution up to a maximum of $50 after you pay the first $25 for each 30-day or 60-day supply, not to exceed twelve 30-day fills of a prescription or six 60-day fills of a prescription through December 31, 2018. Alternatively, this SAVINGS card can be used to reduce your out-of-pocket expense for Perforomist® Inhalation Solution up to a maximum of $350 for each 90-day fill, not to exceed four fills of a prescription through December 31, 2018. No other purchase is necessary. Valid prescription with Prescriber ID# required. Eligibility Requirements: This SAVINGS card can be redeemed only by patients or patient guardians who are 18 years of age or older who are a resident of the United States and its territories. Patients must have commercial insurance. Not valid for uninsured patients (except for commercially insured patients without coverage for Perforomist® Inhalation Solution) and patients who are covered by any state or federally funded healthcare program, including but not limited to any state pharmaceutical assistance program, Medicare (Part D or otherwise), Medicaid, Medigap, VA or DOD, or TriCare (regardless of whether Perforomist® Inhalation Solution is covered by such government program); if the patient is Medicare eligible and enrolled in an employer-sponsored health plan or prescription benefit program for retirees; or if the patient's insurance plan is paying the entire cost of this prescription. Void outside the US and its territories or where prohibited by law, taxed, or restricted. This program is valid in Massachusetts through June 30, 2019, unless otherwise amended or extended by Massachusetts. This SAVINGS card is not health insurance. The SAVINGS card is not transferable and the amount of the benefit cannot exceed the patient's out-of-pocket expenses. Cannot be combined with any other rebate/coupon, free trial, or similar offer for the specified prescription. Mylan Specialty reserves the right to amend or end this program at any time without notice. Data related to your redemption with this SAVINGS card may be collected, analyzed, and shared with Mylan Specialty for market research and other purposes related to assessing coupon programs. Data shared with Mylan Specialty will be aggregated and de-identified, meaning it will be combined with data related to other SAVINGS card redemptions and will not identify you. The SAVINGS card is not redeemable for cash. • Submit transaction to McKesson Corporation using BIN #610524. • Acceptance of this SAVINGS card and your submission of claims for the Perforomist® program are subject to the LoyaltyScript® program Terms and Conditions posted at www.mckesson.com/mprstnc. • For questions regarding setup, claim transmission, patient eligibility or other issues, call the LoyaltyScript® for the Perforomist® program at 800-657-7619 (8:00 AM-8:00 PM EST, Monday-Friday). PERFOROMIST Inhalation Solution is used long-term, twice a day (morning and evening), in controlling symptoms of chronic obstructive pulmonary disease (COPD) in adults with COPD. PERFOROMIST is for inhalation use only through a standard jet nebulizer connected to an air compressor and should not be swallowed or injected. • are pregnant or planning to become pregnant. It is not known if PERFOROMIST Inhalation Solution can harm an unborn baby. • are breastfeeding. It is not known if PERFOROMIST Inhalation Solution passes into breast milk and if it can harm your baby. Tell your healthcare professional about all medicines you take including prescription and nonprescription medications, vitamins, and herbal supplements. PERFOROMIST and certain medicines may interact with each other and cause serious side effects. Perforomist® is a registered trademark of Mylan Specialty L.P.